Your mini-click in flamed titanium is exceptionally beautiful and it writes quite nice. The service was great. The pen is very strong and can easily inflict damage in a self defense scenario. 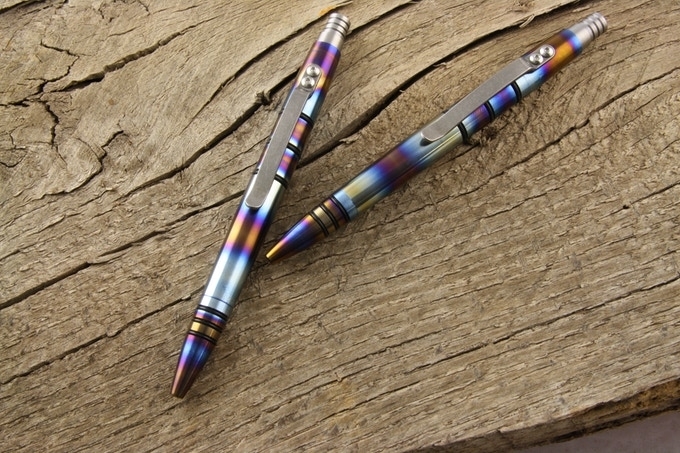 While out of the US, I lost the Titanium flamed Mini-Click I had purchased during a Kickstarter. I was seriously bummed, as it was my favorite pen. So I ordered one on the website so it would be waiting for me when I got home (once I found out Amex was no longer accepted - not a problem). The new pen is smoother finished and smoother operation than the one I lost. I will make sure I don't lose this one! I have 5 tuff writer pens now -- and each one is a quality work of art I can carry in my pocket. I receive a lot of compliments, and "where can I buy one of those" comments when I pull any of these pens out to sign, and I have to be careful about loaning them out -- I'm always afraid they won't come back. Color is amazing. Love the weight. Should be a handy EDC pocket pen. Lightweight, compact, powerful and beautiful. Awesome finish on the pen. Thanks!